You just had your ears pierced. Now what? Here are some tips & advice to help you through the healing period after your ear piercing appointment at Fruition Skin Therapy. Mark your calendar. You have 6 weeks to go until you can change your earrings. Be patient. You have 12 weeks until you can safely change your earrings. Day 1 – You did it! Congratulations. 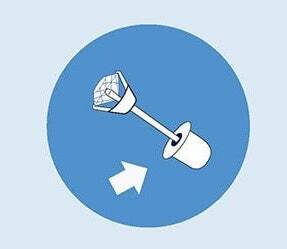 Please follow these tips to help your piercing heal safely. Remember – Pain, redness & swelling are not a normal result of ear piercing. If you experience any of these symptoms, call your doctor & if instructed remove your earrings. Step 1: Clean Hands – Be sure to wash your hands thoroughly before touching your ears or earrings. 2X a Day: Gently clean the front & back of your piercing with a cotton swab soaked in Ear Care Antiseptic 2 times per day. Cleaning Tip: Gentle rotate your piercing earrings at least 3x per day, ideally after you have applied your Ear Care Antiseptic. Always check that the backing of the earring is securely fastened. Be careful of: Avoid irritating your piercing with products such as hair spray, shampoo, soaps, perfume or cosmetics. Be careful when brushing your hair not to catch the bristles on your new piercing. It is best to avoid public pools, hot tubs, freshwater swimming and the ocean for the healing period. If you do swim ensure you clean your piercing throughly with your Ear Care Antiseptic. Sports Tip: Athletes, before you get pierced, ask if you are permitted to protect a new piercing with a band aid or sports tape during games and practices. If not, plan to have your ears pierced in the off-season. Week 6 – If you had your earlobes pierced. You may now change your earrings – Hooray!! We recommend wearing stud-styled earrings for the first 6 months. For best results, avoid heavy earring styles for the first 12 months. Week 12 – If you had a cartilage piercing. We recommend avoiding heavy earring styles for the first 12 months. Ear Lobe: For 6 months following the initial 6 week healing period, never leave an earring out the lobe for more than 24 hours at a time. Cartilage: For the 6 months following the 12 week healing period, wear an earring in the piercing at all times. When an earring is removed, immediately replace with another. Book an appointment today with Fruition Skin Therapy in North Vancouver.